Week 2 of the college football season officially kicked off yesterday with a game between Idaho State and Utah State, but since this is a weekly piece, let me quickly touch on how crazy Week 1 was. There were upsets (Liberty +33 beat Baylor outright by three points and Howard +45 beat UNLV by three points). There were amazing comebacks - see UCLA's 27-point fourth quarter comeback against Texas A&M. And there was dominating performances like the one we saw from Alabama's defense and special teams. If Week 2 is half as good, we are going to be in for another crazy weekend of football. There are three games on the card tonight: Alcorn State vs. FIU (-20 ), Ohio vs. Purdue (-3) and No. 28 Oklahoma State (-28.5) vs. South Alabama. The biggest games of Week 2 take place on Saturday as the fifth-ranked Sooners travel to Columbus to tangle with the No. 2 ranked Buckeyes, No.13 Auburn travels to No. 3 Clemson and No. 14 Stanford heads to LA for a date with the No. 6 USC Trojans. Those games make for great entertainment, but there is no value in any of those lines because the betting public is all over these nationally-televised games. The purpose of this weekly piece is to help you specialize in finding those under-the-radar games with soft lines in order to increase your edge over the book and turn a profit. We all know there are two kinds of bettors - sharps and squares - but what most people don't realize is that most of the sharps specialize in smaller conferences with lesser teams where the lines are softer. The reason being is that these games/teams generally fly under the radar from the betting public, thus leaving more value in the betting line. On the flip side, square bettors would be considered "generalized" bettors, which means they bet on what the media tells them to bet. If the only thing a casual bettor sees is hype videos for OU vs. OSU or Stanford vs. USC, the chances they look elsewhere for a game to bet on is slim to none. If every casual bettor does this, there is rarely any value left in the betting line. Last week I got off to a solid start - cashing a Friday ticket on Eastern Michigan -14. Unfortunately, I gave it back after my Troy +10.5 bet lost by half-point. So far - record to date 1-2, -0.7units. This week I have two "under-the-radar" games from the Saturday board that I absolutely love. I will use $100 as my unit of wager and as always, all lines are courtesy of our friends at BetOnline . If anyone knows anything about this game, I would be very willing to listen since I think this line is the softest on the board and the result won't even be close. UMASS is a second-year FBS team that finished 2-10 last year. They are already 0-2 this season with losses coming to Hawaii as three-point favorites and Coastal Carolina as two-and-a-half point favorites. How they were favorites in both those games is beyond me. Both Hawaii and Coastal Carolina aren't exactly the greatest of teams, which means UMASS is just as bad as I expected them to be. As a team, the Minutemen have allowed an average of 452 yards per game and an average of 217 yards on the ground. They have also already lost three fumbles. Now they must go up against an Old Dominion team that is coming off a 10-3 season and returns eight starters on the offensive side of the ball. Last week, the Monarchs easily handled Albany. I understand Albany isn't a formidable opponent to actually test a team's ability, but getting live in-game action is crucial. The Monarchs will have the most talent on the field at all times and given the fact that the Minutemen have just two FBS wins to their name, I highly doubt they can get a third by beating a Conference-USA favorite. Every year is the same song and dance with square handicappers. They see a result they like or dislike and are quick to overreact and either crown a team or label a team as poor. I believe this is the perfect example of that situation. Sure, the Syracuse Orange play in a tougher conference and against better competition all year, but that should not make them 10-point favorites against a team like Middle Tennessee, who, ranked 12th in the nation in scoring last year (39.7) and eighth in both passing yards (326) and total offense (517). I know, the Blue Raiders managed just six points last week against a Vanderbilt team that's projected to finish in the bottom half of the SEC, but one bad game isn't the end of the world. For the record, MTSU also lost to Vandy last season 47-24 - some teams just have other team's number. The Blue Raiders have a very experienced team, and I expect nothing less than their absolute best effort in this game, which in my opinion will allow them to cover the 10-point spread with ease. 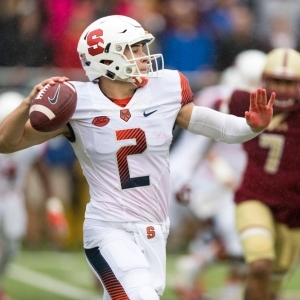 Syracuse is coming off a Week 1 win against Central Connecticut State by a score of 50-7. Congratulations, you beat down a FCS team who went 2-9 last season. I find it very hard to believe the Syracuse defense will be able to contain the Blue Raiders' actual offense tomorrow. This could be one of those games where the last team to have the ball wins, and unless there is an 11-point score in football, I expect MTSU to cover the number.